Although there is a method to his madness, the editor of the Colombo Telegraph has a distinct “mad talent” for offering miscalculated visibility to people, elevating them to public personalities, or giving public personalities unwarranted political magnification. 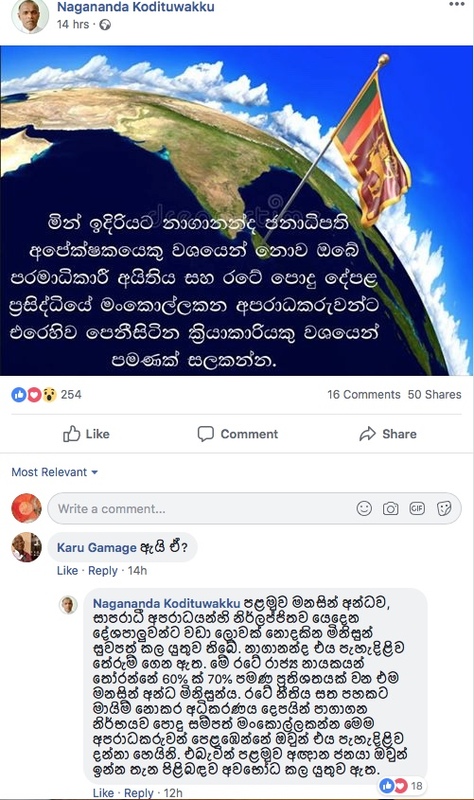 His insinuation of Kumar Sangakkara as next presidential hopeful one year ago and his fun speculation of a Ranil-Patali President-PM mix via his Facebook account have both caused more than a political buzz in the Colombo circles. His personal comments on the importance of ending the Mahinda Rajapaksa era with two constitutional terms inspired an entire stinker chapter in a recent publication by Milinda Rajapaksha, the media spokesman for Presidential hopeful Gotabaya Rajapaksa. However the elevation of Nagananda Kodituwakku to his present state of dubious celebrity via Colombo Telegraph remains the mother of all cakes where the Colombo Telegraph editor’s editorial ‘aathal’ (Sinhala slang for ‘fun’) is concerned. 1. Before taking the shameless politicians to task, I must heal the blind public who do not see this world. 2. Out of that mentally blind public 60-70% will vote to elect the President of our country. 4. Therefore, I must make the stupid public realize this first and foremost. The tragi-comedy of political and good governance activism which is literally hilarious in Sri Lanka is not genuinely funny. It is symptomatic of the caliber of the persons who are elevated by media ‘for fun’ taking the public for a ride. Kodituwakku surfaced, pretty much from nowhere as a voracious and a vociferous commentator in Colombo Telegraph articles appearing in his own name, spewing anti-corruption sentiments, tinged at times with extreme overtones. He displayed little elegance in vocabulary or measured restrain. It was actually a classic case of cyber “me-me-me”. One of the distinct features of Nagananda’s presence in the social media is referring to himself in third person. He displayed a disturbing tendency to refer to himself, not as “I” or “me” but as Nagananda. This trait called habitual illeism in psychiatry is a borderline psychological tendency. Historically and in present day a colorful plethora of personalities are habitual illeists. The readers would be entertained to take a glimpse: Julius Caesar’s Commentarii de Bello Gallico, Henry Adams, Charles de Gaulle, Bob Dole, Herman Cain, Narendra Modi, Mikhail Gorbachev, General Douglas MacArthur, Richard Nixon and Donald Trump. Yes. Nagananda Kodituwakku should have set off some alarm bells a while ago. Kodituwakku is the quintessential example of modern cyber media creating a force that even the force itself cannot fathom or handle. He went on to author a number of Colombo Telegraph articles and became a lone protestor at the parliament square in London and endorsing the banning of the infamous book “Budunge Rasthiyaduwa” – mounting a racist high horse. Quite frankly, these symptoms pointed towards a soft brand of affective and unstable demeanor characterized by berating the public, harsh wordings, calling the public stupid – all disturbing traits for a Presidential hopeful. His flight of thoughts and deed assumed a narcissistic and delusional life of its own and he escalated himself in to his own political climax of declaring Presidential hopes. Note: initially, there were very few citizens rallying around him in spite of some of the very valid points about justice he was raising. To the eternal credit of the editor of Colombo Telegraph he stopped profiling Kodituwakku in Colombo Telegraph following the declaration Presidential candidate dreams. One must be grateful for life’s small mercies. Was It All Talk And No Intention? No. Nagananda Kodituwakku probably has his heart in the right place initially. He had the courage to challenge the quasi- Chief Justice of the Rajapaksa regime Mohan Pieris. He challenged National list abuse and MPs duty free vehicle permit abuse. However the error of this narrative is not so much the issues he was challenging. The error was in fact in his misguided and arrogant belief that the public was stupid and blind. Recently Kodituwakku came back to lime light piggy backing on Sugandhika Fernando, the controversial lawyer who, in a hall mark speech exposed the ugly underbelly of the judiciary. The video of the speech went viral and it fed the moral imagination of the “so-called- stupid” public escalating Kodituwakku’s political trajectory. This was perhaps a significant time in which the “stupid public” really felt in synch with Kodituwakku’s political and moral stance. But rather than addressing the opponents in a rational and just manner, both Kodituwakku and Fernando resorted to losing it in public reminiscent of President Sirisena losing his cashews. Sugandhika Fernando is no longer heard of. Can politicians, activists, lobbyists divorce the public – their ‘clients’ on the basis of their purported blindness or stupidity? The writer came across a hilarious short video by “Jana and Priya” where the patient presents with an arm pain. Upon hearing the presenting complaint, the doctor unilaterally describes all the intricate symptoms to the patients and say, “I will prescribe you some medicine”. The surprised patient asks “doctor how did you narrate all my symptoms one by one” The doctor says “Son, I have the same pain for ten years. No medicine works – wait, I will prescribe you some medicine”. The crucial truth that Nagananda Kodituwakku and the self-righteous “activists” forget is that they are a sample from the population they sanctimoniously insult. The people and their leaders are as they both are. The second important thing that they have not learnt is that if doctors divorced their patients because the patients don’t heed advice, modern medicine will perish. If the teachers divorced the students because the students don’t heed their advice, education will perish. Like the doctor in the video clip, what is ailing the patient is also ailing the doctor. But the doctor will continue to prescribe treatment (ironic as it sounds). Emotional tenacity, emotional management and grit are probably the most predictive qualities of political (or any) success. Kodituwakku has self-immolated his haphazard and ego centric performance because he missed some crucial point about politics and the people. He should now dismount his high horse.